Home News And the winner is…..
Haley McKeown, winner of NVSO’s 2019 Summerford Violin Concerto Competition. Photo by Marc McKeown. 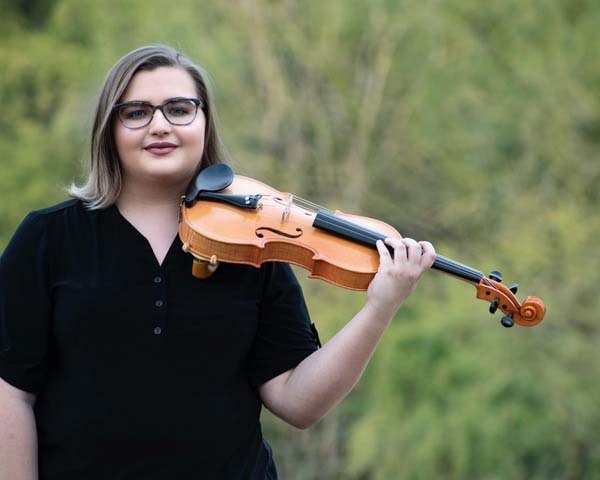 Phoenix resident, Haley McKeown, was recently announced as the winner of a brand new handmade violin, valued at over $5,000, after competing in North Valley Symphony Orchestra’s annual Summerford Violin Concerto Competition. Haley will perform Vivaldi’s Violin Concerto in A minor on her new violin at NVSO’s “Spring is in the Air” concert, March 9th 7:00 p.m., at North Canyon H.S. Performing Arts Auditorium (1700 E. Union Hills Rd.). Haley began playing violin in 4th grade in her elementary school orchestra, and began private lessons just before entering 5th grade. In middle school, she started a quartet with a few close friends, then joined North Valley Symphonettes as concertmaster. She successfully auditioned into North Valley Youth Orchestra her freshman year, then into North Valley Symphony Orchestra (adult orchestra) her senior year. She is currently principal second violin for North Valley Youth Orchestra, and plays in the first violin section of the adult orchestra. Haley had the honor of participating in Regional Honor Orchestra her last three years of high school, and played with the PVUSD District Honor Orchestra her senior year. She was a member of Tri-M while in high school, was concertmaster her senior year, and currently studies violin performance at Paradise Valley Community College. Additionally, Haley plays in the pit orchestra for Valley Youth Theatre. She will transfer to ASU in the fall of 2019, pursing a degree in violin performance, or music education. This year’s competition was held on January 27th. The application process for the competition consisted of composing answers to five essay questions, obtaining a letter of recommendation from outside the NVSO organization, and auditioning in front of a panel of judges. Applicants must also be members of North Valley Symphony Orchestra’s Symphonettes, Youth Strings, or Youth Orchestra. The prize violin is donated every year by local luthier Jody Summerford, who recognizes the work that the NVSO artistic staff is doing to nurture and develop young musicians in the Phoenix community. Mr. Summerford was nominated by the AZ Citizens for the Arts for a Governors Award recognizing his philanthropic work for NVSO in 2017. NVSO wishes to invite young strings players to join one of NVSO’s youth orchestras for the 2019-20 concert season. Auditions for North Valley Youth Strings and North Valley Youth Orchestra will be scheduled May 19th and June 1st and 2nd. No audition is required for North Valley Symphonettes. For more information about membership in one of the youth performance groups, visit the website, northvalleysymphony.org, and click on the “Join Us” tab.